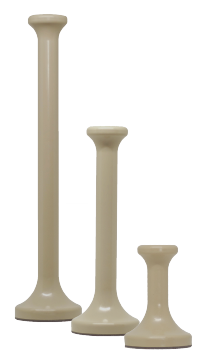 We at Ergo Pros specialize in offering Ergonomic Handles for Sliding Glass Windows. The ErgoGlide® is an ergonomic handle which aids in the opening and closing of sliding glass windows. Primarily, the ErgoGlide® alleviates unnecessary discomfort for office receptionists who often have the repetitive task of opening and closing sliding glass windows hundreds of times per day! These windows are often mandated to remain closed in order to maintain confidentiality within the workplace. While in use, the ErgoGlide® allows a receptionist to remain ergonomically positioned, reducing musculoskeletal strain and common workplace injury claims caused by overreaching, over stretching and repetitive motion tasks. 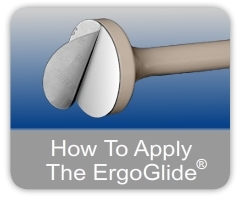 The ErgoGlide® is affordable, Easy to apply and durable! Available in three accommodative lengths (3", 6" and 9" inch), the ErgoGlide® ergonomically and ascetically suits any office environment. The durability of the ErgoGlide® withstands repetitive use. Applying the ErgoGlide® is a breeze; specifically formulated adhesive, strongly bonds with any glass surface immediately and sets for just a few hours prior to initial use. The ErgoGlide® bond has been tested to outlast window cleaning chemicals as well as hundreds of consistent window glides per day! Testimonials from receptionists around the country have driven Ergo Pros (The inventor of the ErgoGlide®) to proactively promote the product as an ergonomic tool that has, in fact, relieved pain and changed the comfort of the working environment for receptionists everywhere. "ErgoGlide®... Glide through your day ... the right way!"